The profiles of the customers get registered in the UVdesk automatically when a customer sends support e-mails to the support for the very first time. The owner can add or edit any existing customer by simply clicking on Customers section. UVdesk allows the administrator or the agent ( who has the privilege of adding customer) to Edit, Delete & Add the customer profiles. On the Dashboard, you will see "USERS" menu and under it, you will find "Customers". Click on the "Customers" Icon and then you will be redirected to a new page. In the new page, you will see a list of existing Customers with Edit & Delete Buttons and "New Customer" button. Hit the "New Customer" button and then you will see a new page for creating New Customer. 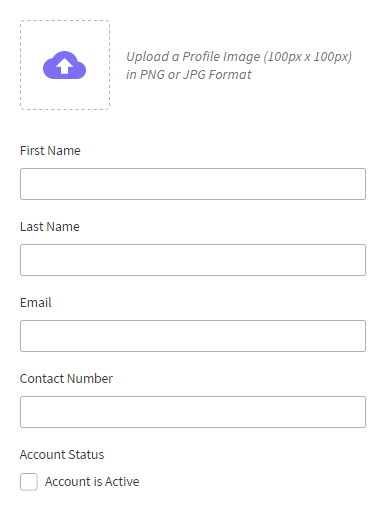 Upload the image of the customer if any. Then enter the First Name, Last Name, Email, Contact Number. Tick on "Account Status" for Enabling that customer. Click on "Save Changes" to save information and create a new customer. The owner can also create a new Customer from the UVdesk Dashboard. 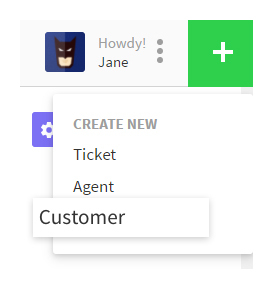 On the Dashboard, there is a (+) sign on the top right corner and when you will click on that plus (+) sign, then you will see create a new option for "Ticket, Agent & Customer". Click on the "Customer" option and then you can add a new Customer in the same process as explained above.